Role Play- Primary English lesson....What's My Name? 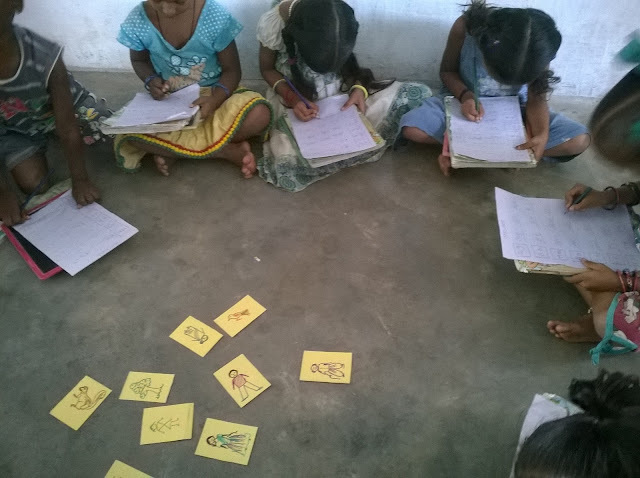 Multi class teaching is a very headache to govt primary school teachers in Andhra Pradesh. So while teaching multi class, teacher should be competent to plan whole class activities to that topic. It is one of my best activity maths tool to exercise EXPANSION OF NUMBERS. I prepared with used drink bottle and dice. After gave idea of expand a number I asked my children to sit in a circle and do some problems to test their understanding. 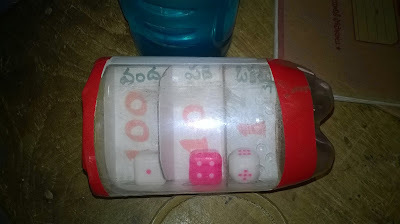 I gave this tool to my children each will roll the bottle and write the number in their books and expand it. Then I get a chance to teach to other class children. You can see in below picture how did my children do these sums. Many of us know about colleague. We arrange many pictures systematically to convey the total message of the picture or event. When I learnt about colleague craft teaching in British Council training, I am applying these method in my lessons whenever there is a chance. 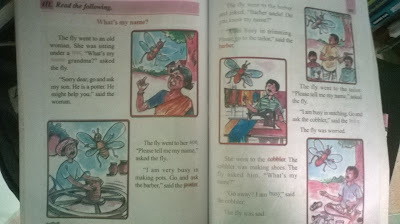 I planed these colleague based teaching method in picture based interaction with my 4th and 5th class children. I gave so many trainings using this method in cluster and district level. 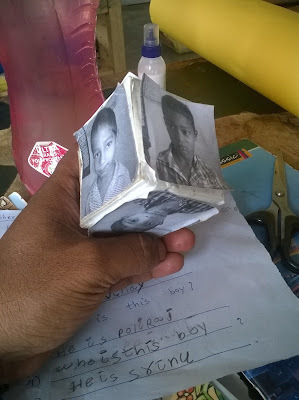 There is a lesson in fifth class THE WITTY NASIRUDDIN, I taught in this method. 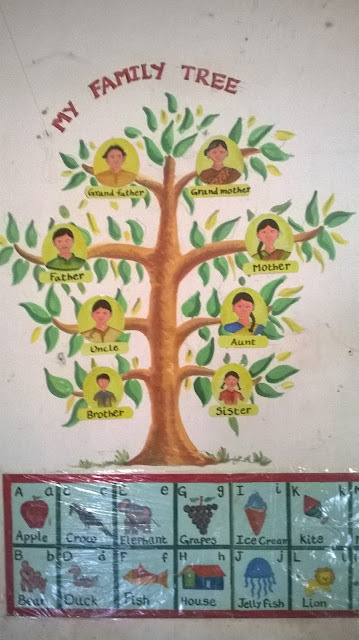 Especially the mother tongue influence children cannot grasp the words by watching entire picture. And its not interest to describe the picture by showing its whole. 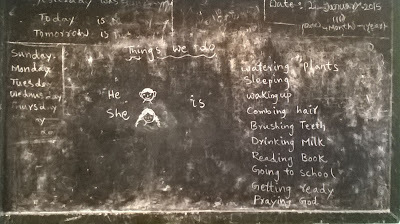 When I assessed my children after this method of teaching they wrote very well and learnt very fast. Topic: The Little Red Hen Class: 3rd Skills: Speaking and Creative Expression. 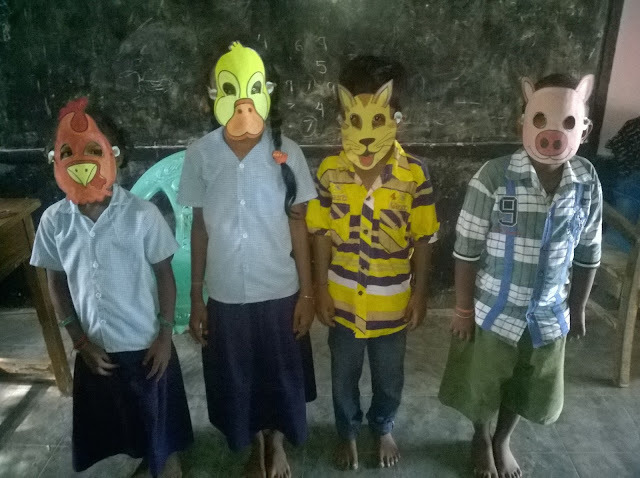 Role Play is one of the good teaching methods to develop cumulative language skills in the children. Children also involve very well with a great interest. 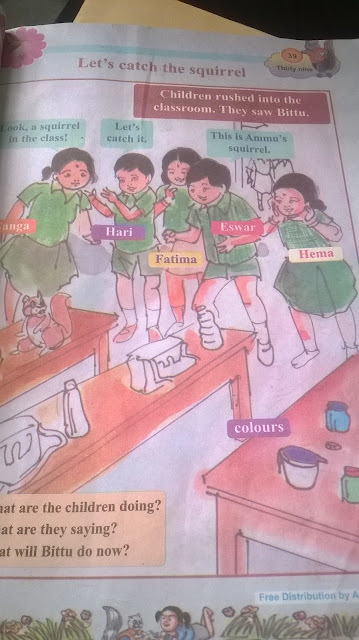 This the famous story and my children tried best to perform well. Once I completed the lesson I allotted the dialogues to my children and asked them to practice. I prepared masks for the characters for the better impression. Gestures take crucial roll in communication. Some times gestures are enough to say every thing. In learning new language, many educationalists say that gestures will help to learn and remember the language very fast. 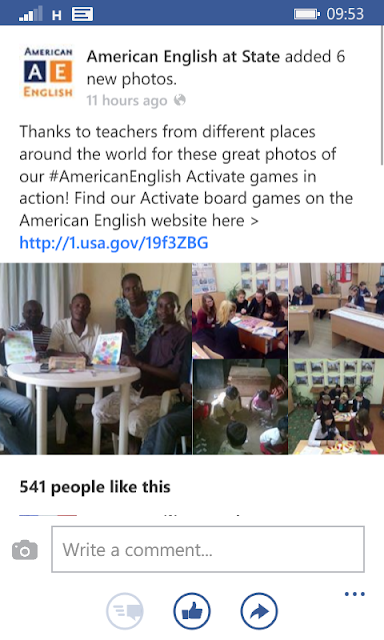 After I watched the Pie Corbet videos of teaching, I came to know that I should use gestures to develop English language skills in my children. So I made a attempt and succeed. See the below video of above story. 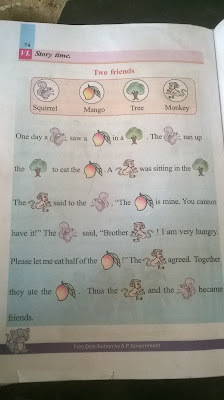 My children easily got the difficult words and recite the same. 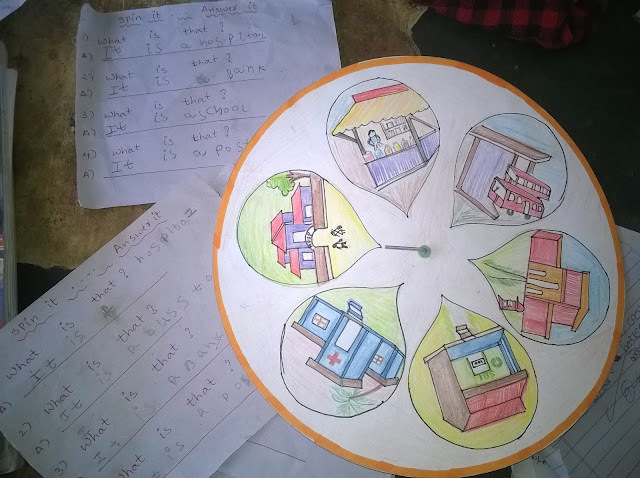 Creative primary English writing activity. (SPIN IT ..ANSWER IT) .. " What is that?" Best English Primary Concept Writing Activity..."What do you do with your kite?" Developing writing skills in primary school children is very difficult. Because they are mostly belongs to illiterate families and highly influenced by their mother tong. 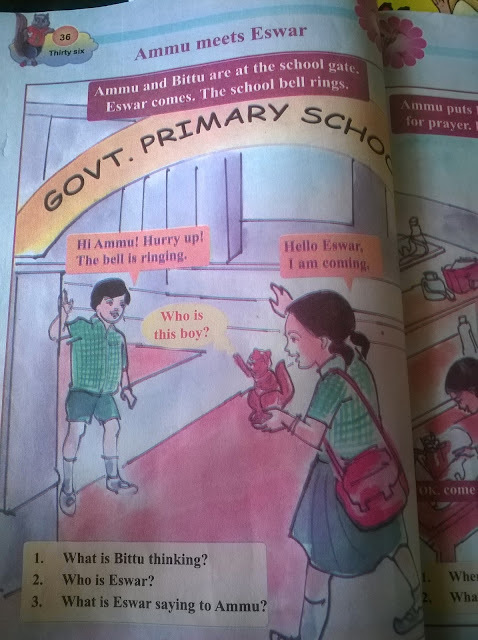 So developing English writing and reading skills is very difficult to teachers who works with those children. To attain the language skills in children we need some creative activities to developing reading and writing concepts. 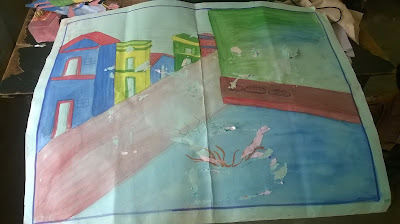 This a activity, I planned with my 2nd class children to write about " What do you do with your kite?". For this creative question I gave some ideas and asked my children to made their own kite and write the answer on coloured slips and paste it on tail. 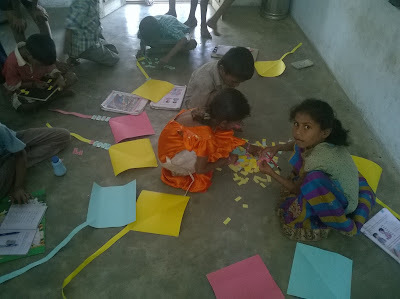 You can see in these pictures, the active participation of children. They enjoyed a lot. 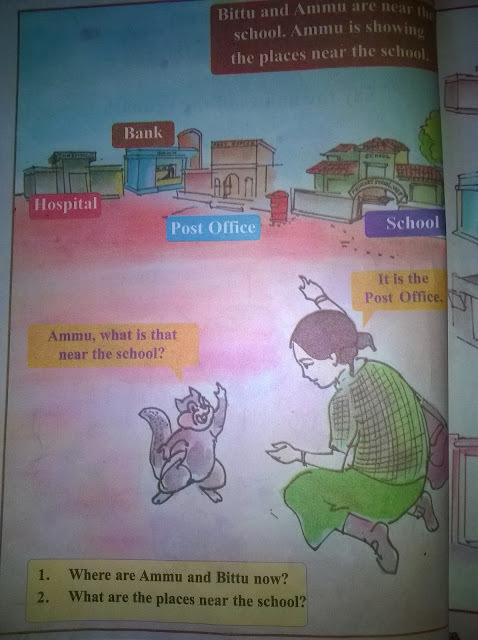 English Primary Vocabulary Game: Where is the.....................? 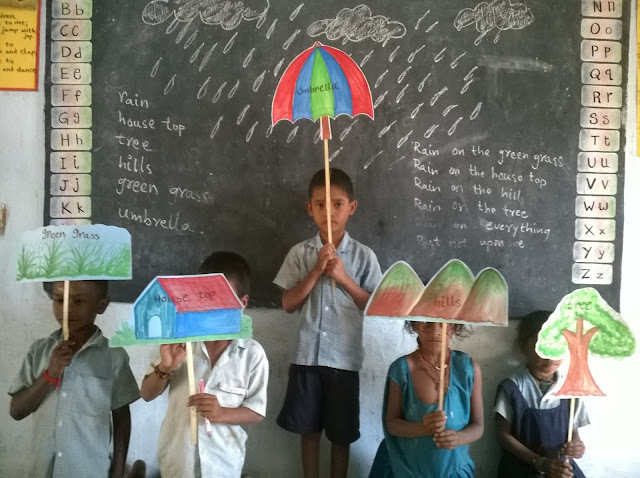 Topis: Rain on the Green Grass - Rhyme Class: Preprimary Skills: Creative Expression. Children always love rhymes. Most children enjoy hearing and participating in rhyming activities, and when they are exposed to rhyming, they usually pick it up naturally. So I always try to set such an environment with material to achieve the langauge standerds and remember the rhyme forever in thier brains. Hope you enjoy the rhyme. Please watch the video.